This product combination offers a very economical solution for sublimation printing. 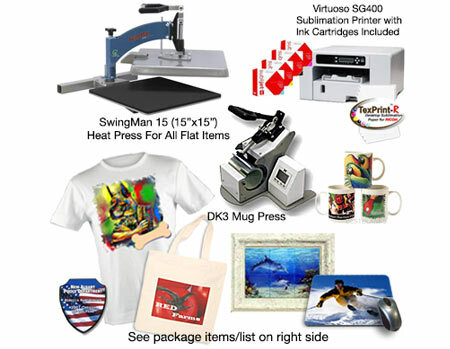 With the SwingMan15 15"x15" heat press you can still print on most any flat item. However, keep in mind the maximum size print cannot exceed 14.5" x 14.5" (within the heat press size). The DK3 mug press handles the most common size mugs and is perhaps the best in the industry and at a better price and warranty than most. With this product combination you can print transfers to produce: Mugs, License Plates, Picture Frames, Clip Boards, Tiles, Mouse Pads and Many More Products! Please see this link to view all of the products you can produce. Virtuoso SG400 Sublimation Printier - Prints up to 8.5"x14"
SubliJet HD Ink Cartridges - Set of 4 (CMYK) for the SG400 Virtuoso printer. Hix SwingMan 15 (Economy Press 15"x15") For All Flat Items - FREE SHIPPING! This is a great heat press, economical and easy to use. With this heat press you can print on Shirts, Mouse Pads, Ceramic Tiles, Tote Bags, Puzzles and just about any flat item up to 1.5" thick! The SwingMan 15 allows you to lay out items away from the heat platen and then apply pressure straight down so that the transfer is applied evenly. Economical, yet perfect for applying all types of transfers including plastisol, foils, sublimation, ink jet and more. Press swings out to the side allowing easy loading & unloading. Work safer & faster, hot plate is not facing the operator. Stain Protection for Your Heat Press - Premium grade 15"x15" Non-Stick Sheet & Non-Stick Pad Protector. Keeps the upper & lower heat press platens clean from hard to remove inks. Full wrap-around, handle to handle, top-to-bottom printing. Press images up to 5" high, and as close as 1⁄2" from the handle, depending on the mug size. Allows for full bleed transfers on even the most demanding mugs. Fully adjustable, accommodating 11 oz, 15 oz, 16 oz, mugs & steins. Finally - a mug press that compensates for less than perfectly straight mugs. Sublimation Training Videos See How It Is Done! Wall clocks, Desk Clocks, Clipboards, Dry Erase Boards, Plaques, etc. Note: Printing with sublimation inks requires certain criteria be met for your computer operating system & design software. See "System Requirements" above for more info.